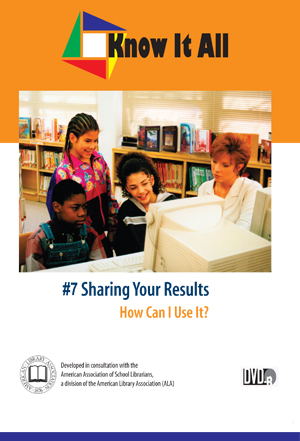 Sharing Your Results : How Can I Use It? Home > • Language Arts > Know It All > Sharing Your Results : How Can I Use It? Deciding how to present a project on fairy tales has Cammy, Alex, and Nicole stumped at first. When they start to consider ways other than a written report, they become excited about the project. Using Nicole’s video skills and their own research and acting skills, they come up with a clever way to present their project. Your students learn about the various ways to present information, and how the format can affect their search and its results. Rights granted with purchase include: a) life of media audiovisual use, b) public performance, c) campus or building closed circuit and digital/video-on-demand transmission.